Paymatrix, Hug Innovations and Kheyti were recognized for their contribution to the state in the field of technology. Three Hyderabad-based startups, incubated at Telangana-based incubation center T-Hub were recognized by the state government at the State formation day on June 2. This was part of the Telangana State Formation Day Awards 2017 that was presented for contribution across categories. Presented by Telangana IT Minister KT Rama Rao, Paymatrix won the award for the best women-led startup. Paymatrix provides credit to tenants to make rental payments and lets landlord manage rentals from multiple properties on its platform. It was by Anusha Kurupathi Parambil, Muralidhar Naik and Mukesh Chandra Anchuri. “This award is a recognition that women can come into the world of startups and lead a change. In this context, we have been also recognized for our efforts in enabling property rental transactions go completely digital and thus enabling the collective vision of achieving a less cash economy. This, we believe also is a recognition of the belief and hard work put by our entire team in realizing this vision,” says Anusha. Hug Innovations bagged the best hardware startup award at the same event. Hug Innovations is touted as the world’s first smartwatch with gesture control and an IOT platform. It lets you control a range of devices from a drone to virtual reality games and volume of the music on your phone by just moving your hand around. “We were awarded along with big corporates like Microsoft and Tech Mahindra. For a startup to win an award on such a platform, the satisfaction is immense and that’s what happened to me. Recognition from the Telangana government gives me a sense of accomplishment. Now I know we have really made a mark,” says Raj Neravati, founder and CEO of Hug Innovations. Agritech startup Kheyti won the Best Sustainable Award. Kheyti designs, adapts and implements low-cost farming solutions that help small farmers increase the yield and predictability of their produce. Kheyti has designed ‘Greenhouse-in-a-box’ – an affordable, modular greenhouse bundled with full-stack services that uses 90% less water, grows seven times more food, giving farmers a steady dependable income. “We have reached a total of 50 farmers now and with the results of the first season with the farmer out, they matched our expectations by 75%. Our farmer who got the highest yield received the award on behalf of Kheyti. It is just another day for me but a big milestone for them to have received this from KTR. This should motivate many more to work hard,” says Sathya Raghu V Mokkapati, co-founder, Kheyti. Authbase, another startup from T-Hub also won a recognition on a global scale. 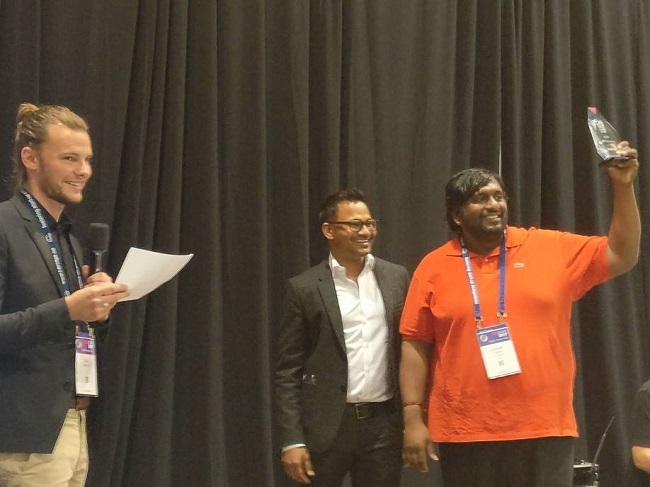 TiE, a global, not-for-profit network of entrepreneurs and professionals recently held TiEcon, the world’s largest conference for entrepreneurs where it recognizes early-stage technology startups from across the globe by awarding them the TiE50 top startup award. At this event, Authbase was one of the recipients of the TiE50 Top startup award. Authbase provides frameworks for developers to secure their applications even before they are launched and use Deep Learning to detect and mitigate hack and bot attacks real-time. “We won the HOT100 Technology Startups 2017, Innotrek 2017 and now TieCon Silicon Valley Tie50. It feels great to be receiving these awards especially from titans of industries.It's very inspiring and tells you exactly where to be next, energising us to keep striving for excellence and to keep building greater better products,” says Umesh Thota, founder, Authbase.